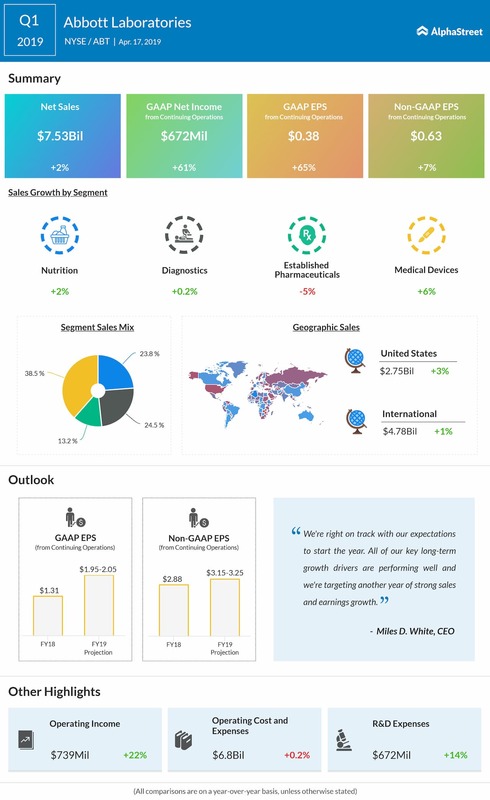 Abbott Laboratories (ABT) announced its first-quarter 2019 earnings results on Wednesday, April 17, before the opening bell. In the three-month period, worldwide sales grew 2% to $7.5 billion, with earnings from continuing operations jumping 65% to 38 cents per diluted share. Adjusted diluted EPS from continuing operations improved by 6.3% to $0.63. Total net earnings jumped 61% year-over-year to $672 million. Back in January, Abbott also received the FDA approval for a “new, expanded indication” for its MitraClip device to treat clinically significant secondary mitral regurgitation — a leaky heart valve resulting from advanced heart failure. Then in March, Abbott obtained the CE Mark for its Alinity (molecular) diagnostics system and testing assays to aid in infectious disease testing. Abbott now projects full-year 2019 GAAP earnings to be between $1.95 to $2.05 per diluted share, and adjusted diluted earnings from continuing operations to be $3.15-3.25 per share for the same period. For the second quarter of 2019, Abbott sees GAAP diluted EPS of $0.47-0.49, and projects adjusted diluted earnings from continuing operations of $0.79-0.81 per share.